Ujung Kulon National Park in Indonesia’s Java island is the last remaining habitat on Earth for the critically endangered Javan rhinoceros. The rhino population is holding steady, but its survival is threatened by natural disasters and a genetic bottleneck due to its small population. Conservation efforts, particularly finding a second home for these creatures in a lower-risk area, have long been planned, and now is the time to implement all of them to protect the rhinos from extinction. On the evening of Dec. 22, 2018, a group of fishermen who had snagged a saltwater crocodile in their net brought it to Paniis beach in Pandeglang district on the western coast of the island of Java. The sight of this elusive creature drew a crowd of locals to the beach that evening. All of a sudden, they heard the roar of a wave approaching. Recognizing these two events as warning signs from nature, the people of Paniis village headed for the slopes of Mount Honje, south of the village. Soon after, a devastating tsunami struck the shore. 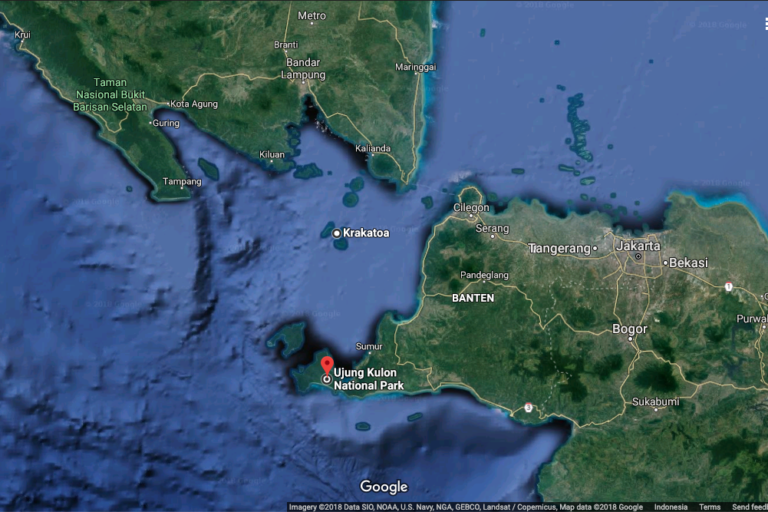 A Google Maps image showing Ujung Kulon National Park and the volcano of Anak Krakatau in the Sunda Strait. Triggered by a landslide in the Sunda Strait that was in turn caused by a massive eruption of the Anak Krakatau volcano, the tsunami hit the western tip of Java and southern end of Sumatra. More than 400 people were killed in the disaster, but only one of them was in Paniis village, according to an official at the Ujung Kulon National Park in Pandeglang. Honje spans some 195 square kilometers (75 square miles) and is part of the national park, which is also home to the world’s last remaining population of Javan rhinoceroses (Rhinoceros sondaicus). At least 68 of the critically endangered animals have been counted in the park, a protected zone that covers 1,230 square kilometers (475 square miles) at the tip of Java. A rare image of a critically endangered Javan rhino. Image by Robin Moore/Global Wildlife Conservation. Anak Krakatau, the volcano that triggered the tsunami, is a remnant of the legendary 1883 explosion of the more famous Krakatau. It’s still growing, and the ongoing series of eruptions are part of its growth process. “Though it might take hundreds of years [for Anak Krakatau] to erupt like Krakatau in 1883, the ongoing cycle must be monitored carefully,” said Yanwar, an expert on earthquake and tsunami mitigation, now retired from the country’s geophysics agency. But the volcano isn’t the only threat to the Javan rhino. “The small population, at only 67 [sic] individuals in one habitat in the Ujung Kulon peninsula, has showed a decline in genetic quality,” said Rois Mahmud, the rhino conservation coordinator at WWF Indonesia. One male rhino has been nicknamed Robot, because he has a foot so swollen that it drags when he walks. Another is called Rawing, the word for a leafless branch in the local Sundanese language, because one of his ears is folded and torn. “The results from a genetic analysis on rhino feces show that 19 sampled individuals come from only two maternal lineages,” Rois said. 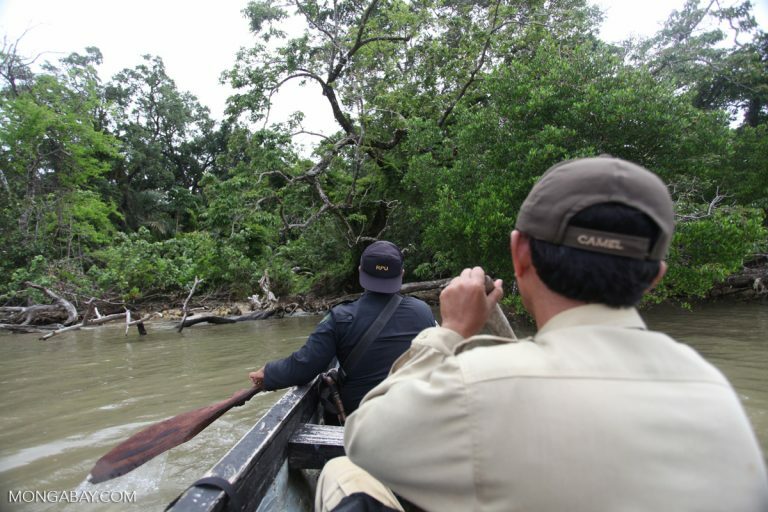 A rhino protection unit patrols Ujung Kulon National Park by water. Image by Rhett Butler/Mongabay. When two local rhino-hunting kingpins, Sarman and Murdja’i, were taken down in 1974, the poaching was believed to have come to an end. But the fight against rhino poaching has never abated. The park today has five rhino protection units, mainly tasked with keeping poachers at bay, that have operated since 1999. Plans to establish a second habitat, where the rhinos can be safe from natural disasters and poaching, have been tossed around since 1993, when the 10-year Indonesia Rhino Conservation Strategy and Action Plan was first drawn up. At the end of that period there was still no second habitat, and the idea was carried over to the 2007-2017 action plan. The government is now drafting its third 10-year action plan for the Javan rhino, for 2019-2029. The latest draft, produced in January this year, suggests expanding the rhino habitat in Ujung Kulon. The current habitat is focused on the lowlands of the Ujung Kulon peninsula, connected by an isthmus to the rest of Java. The peninsula lies at the western end of the isthmus, while Honje is to the east of the narrow strip. 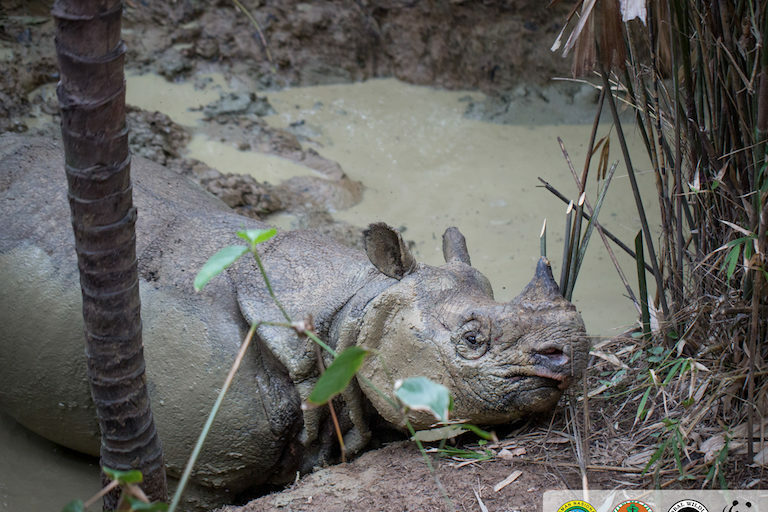 Parts of the mountain have already been dedicated for the Javan Rhino Study and Conservation Area (JRSCA), a successful ongoing project by conservation groups and the government to increase the usable habitat, with three main corridors for the rhinos. According to park chief Mamat, three male rhinos have been recorded in these corridors. One of them, called Samson, was found dead on a nearby beach in April 2018 from natural causes. 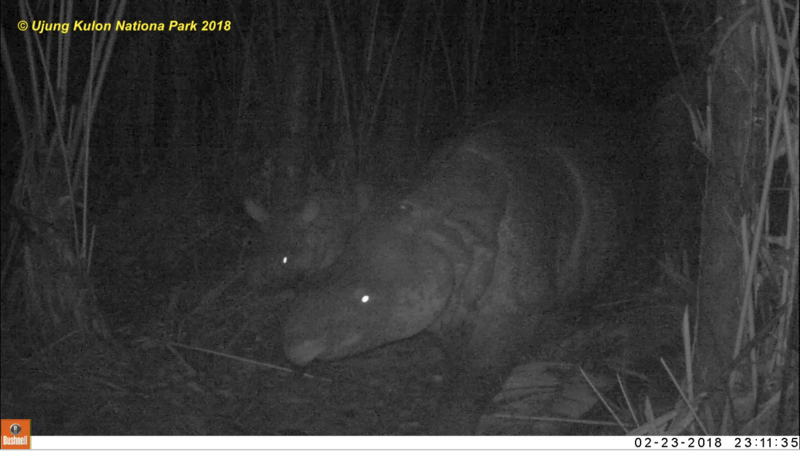 A female Javan rhino and her baby caught on camera. Image courtesy of Ujung Kulon National Park Agency. Before it can be implemented on the ground, the planned expansion must first be made known to the people living near the park. 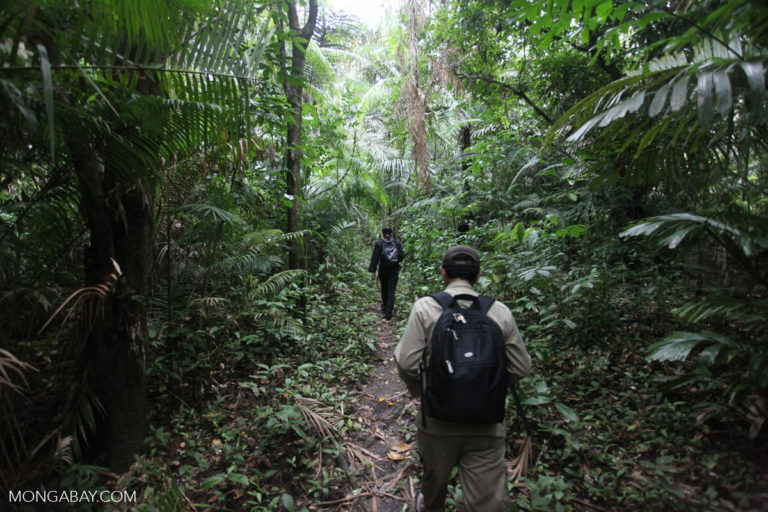 This will take some time, particularly as it requires finding alternative solutions for local people who depend on venturing into parts of the park to scavenge for forest products. “Raising awareness about the habitat expansion in the community must be done immediately,” said Hadi S. Alikodra, a senior conservation expert in Indonesia. Once the community is on board with the planned habitat expansion, it should be fairly easy to carry out the feasibility study and establish the corridors that would connect the rhino sites. Harini Muntasib, chief of management and planning at the JRSCA, said her team was prepared to help with the rhino habitat expansion plan. A Javan rhino patrol in Ujung Kulon. Image by Rhett A. Butler/Mongabay. The plan to establish a second habitat for Javan rhinos needs to be carried out immediately. Right now, only 60 percent of the Ujung Kulon peninsula is inhabited by rhinos. The remainder, comprising the slopes of Mount Payung to the west and Mount Kendeng in the middle, isn’t used by the rhinos, which prefer lowland forests. “It isn’t easy to get a second home for Javan rhinos that’s like Ujung Kulon,” said Widodo Ramono, executive director of the Indonesian Rhino Foundation, at a meeting to draft the action plan in January. He said the rhinos were “forced” to live in Ujung Kulon because the risk of poaching was high in other areas. 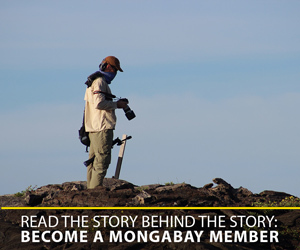 The second habitat indeed has to meet a list of requirements: a habitat that fits the rhinos’ way of life; that is accessible for long-term management; that is safe from hunting and habitat destruction; that is unlikely to be hit by a tsunami (i.e. it’s located inland), earthquake or volcanic eruption (away from geologically active zones), and landslides (far from hilly terrains); and that has diverse vegetation, especially high-nutrition plants. Besides the technical planning, rescuing the Javan rhino will also require adequate funding. All of this will take strong commitment on the part of all stakeholders. Without concrete actions, whatever is being planned will mean nothing if the Javan rhino is allowed to go extinct. Haerudin R. Sadjudin is a senior rhino researcher who has been involved in rhino conservation programs for more than 40 years in Indonesia. This commentary was first published on our Indonesian site on March 1, 2019.